His Beatitude celebrated the 4th Sunday of Great Lent at St Nicholas Cathedral. The commemoration of the repose of Saint Tikhon of Moscow, His Beatitude's patron saint, was also celebrated yesterday. April 7 is also the anniversary of His Beatitude's monastic tonsure. Joining His Beatitude at the Divine were cathedral clergy and hieromonk Alexis (Trader). At the conclusion of the Divine Liturgy greetings for His Beatitude's name's day from Archbishop Nathaniel on behalf of the Holy Synod, Archbishop Demetrios of the Greek Orthodox Archdiocese, and President Donald J Trump were read. The parish community and the parish sisterhood also greeted His Beatitude with flowers and a small gift of a Christ and Theotokos icon set. Following the Divine Liturgy a lenten meal was offered to mark His Beatitude's name's day. At the meal many years was sung for Subdeacon Roman Ostash, who, after ten years of service to His Beatitude, will leaving his position at the end of this week. 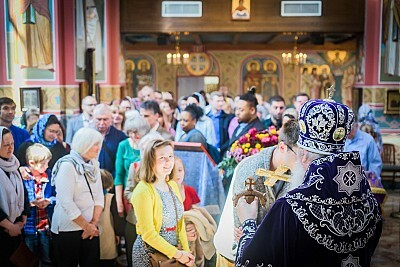 The Archdiocese of the Washington, D.C. is part of the Orthodox Church in America, which is the local presence of the One, Holy, Catholic and Apostolic Church established by Jesus Christ and faithfully transmitted through her Scriptures, worship and prayer life, and through the teachings of the Holy Fathers. The Orthodox Faith maintains unbroken continuity with the Apostolic Faith; embraces all languages, cultures, and races; and calls all to "come and see." Please join us in worship and fellowship.